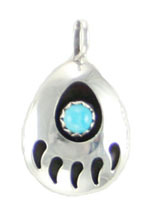 Sterling silver shadow box small (aka:standard size) bear paw pendant with one 3.5mm or free form turquoise stone. Measures approximately 13/16" long including bail x 9/16" wide at its widest. Navajo crafted by Gaynell Parker.